You can’t expect to keep your wits in the end if you don’t work towards a healthy mind. Your mind is the same as your body. You’ve got to use all your muscles. That’s why crossword puzzles, which focus on a narrow ability, don’t offer a full mental workout, says Jessica Langbaum, associate director of the Alzheimer’s Prevention Initiative at the Banner Alzheimer’s Institute in Phoenix, in a NPR interview. Langbaum says the goal of mental workouts is to delay the onset of cognitive impairment and keep the brain working at the same capacity longer. To do that, she says you must keep multitasking, remembering, and processing information. Luckily, the brain’s plasticity allows it to change as you grow older. So there’s always a chance to make a difference. 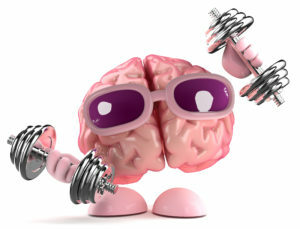 The more you use your brain in challenging, complex tasks the stronger it gets. For instance, when you learn something new, the knowledge develops neural pathways and networks making the brain more flexible. A study of nearly 3,000 people over 65 years old participated in three types of cognitive training: speed processing, memory training and reason training. The study showed all three groups were able to prevent age-related cognitive declines for at least five years. The exercise helps prevent the brain from shrinking and increases the formation of new brain cells in the hippocampus, helping store short term and long term memories. In another study, older adults learned new skills like quilting and photography and then took memory tests. Their results were compared to memory tests of control groups who performed less challenging activities like watching movies. Only those who learned a new skill had their memory improve and those increases were still there when they were tested again a year later. Socializing is also important to brain health, especially in mid-life, in reducing the risk of Alzheimer’s disease. “There’s something about being around people that’s helpful for our brains” Langbaum says. Would you do 5 minutes of mental workouts a day to prevent Alzheimer’s? Let us know in the comments section of Facebook! This entry was posted in Culminant Health, Mind by Senta Scarborough. Bookmark the permalink.